As Democrats, we stand in the streets as well as in the voting booth to make change. We also rely on grassroots donations to keep building the party, become a monthly donor today! This Sunday all across the country, Democrats will take to the streets for rallies and community discussions around saving our health care. If the GOP gets their way, 30 million Americans will lose health insurance. Gov. Ricketts has already left over $850,000 of our tax payer money on the table that could have covered over 54,000 Nebraskans because he refuses to expand Medicaid like other states. Join us for a #SaveHealthCare rally this Sunday! If you can not join us at one of the rallies, we are making signs during the NDP meeting this Saturday. See the full agenda online for the State Central Committee, Caucus and Congressional District meetings. All are welcome!! Can you help us reach our goal of 100 monthly donors? 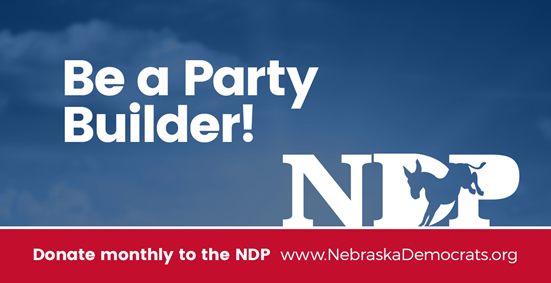 Donate today to be a Party Builder!